Your knee has a tendency to become swollen and stiff after replacement. Knee exercises are critical to prevent stiffness and improve your knee motion. Start exercises as soon as possible. Goal for first 2 weeks after surgery is to make sure your knee fully straightens and bends to 90 degrees. After 2 weeks, goal is to increase knee bending and initiate muscle strengthening. It is harder to straighten the knee than to bend it and your knee may have a tendency to not go fully straight due to swelling and quadriceps muscle weakness. Make sure you keep your knee stretched out by placing an elevated bump under your heel (not knee), especially when you are going to sleep or when sitting for longer periods of time. This will stretch the back of your knee and keep it straight. In general, your final knee motion will be within 10 degrees (more or less) from where you started before surgery. You should see progress in your knee motion every day. If 2 – 3 days have passed with no progress or if a certain exercise is causing increased pain, you are probably not exercising properly. Below are basic knee-focused exercises that are recommended after knee replacement. Your physical therapist may recommend additional exercises depending on your particular situation and stage of recovery. 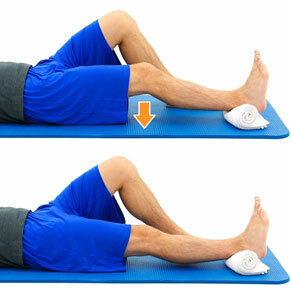 You can exercise both knees at the same time or just focus on the replaced knee (whichever is more comfortable). There is no magic number on many times you should repeat each exercise. In general, start by repeating each exercise 10 times and increase as tolerated over the next days. Take regular breaks and exercise only to your tolerance. If lying flat on a solid surface, place a bump (example: a rolled-up towel) under your heels (Figure 1). Push your knee down toward the floor by tightening your quadriceps (muscles on the front of your thigh). Hold your knee as straight as possible for a few seconds (you'll feel a stretch in the back of your knee) then repeat. If sitting (recommended over lying flat), place the heel on the same side as the replaced knee on an elevated object (example: a chair, Figure 2). Move yourself as far back as possible to maximize your leg length then push your knee down toward the floor by tightening your quadriceps (muscles on the front of your thigh). Hold your knee as straight as possible for a few seconds (you'll feel a stretch in the back of your knee) then repeat. Note: when using a bump to elevate your heel, the bump should be thick enough to create at least 2 inches gap under your operated knee. Your heel should remain on the bump and not move. If lying flat on a solid surface, bend the knee by sliding the heel toward the buttocks (the heel stays on the floor). Bend your knee as far as possible, hold for a few seconds, then straighten it fully and repeat. If necessary, you may use your other leg to assist in bending further by placing it around your operative leg and pulling it toward you (Figure 3). If sitting (recommended over lying flat), bend your replaced knee as far as possible. Hold in the knee in the maximum bending position for a few seconds, then repeat (Figure 4). If necessary, you may use your other leg to assist in bending further by placing it around your operative leg and pulling it toward you. Walk! Walk! Walk! It may feel strange the first time you walk, but the more you walk, the more your gait returns to normal and the faster you get rid of your walker, cane, etc. Trips to the bathroom or kitchen are not enough. Remember, the #1 priority in your knee rehab is regaining range of motion. Strengthening comes later. Keep your pain under control. Do not fall behind or you will struggle with rehab. Don’t use a cane unless you need it. Use a walker instead, and as you get comfortable, transition to walking on your own. Do not compare yourself to others who had knee replacement. Focus on yourself! Numbness around the incision, swelling, pain, stiffness, and warmth can all happen and are part of the surgical course. These should improve every day. Remember, regular exercises are key to a happy knee. Plus, activity is the body’s natural mechanism of blood clot prevention.